Our group has a double birthday celebration walk tomorrow, so there'll be cake, nibbles and maybe the popping of a champagne cork at some point. We're starting in Castleton, as it's a fairly central location for group members to get to. We'll be doing the 'classic' route over Mam Tor, the Great Ridge & Lose Hill, then returning from Hope via the riverside path. Weather doesn't look too great but there's always a cave or two to take shelter in! Sounds like fun. Though we have thunder and lightning forcast hear, so I will be avoidng caves. Tomorrow walk up on the Southdowns, starting from South Harting to Hooksway for lunch (Royal Oak) and then back via Beacon Hill. Going to be a sunny day. Today my son and I took part in the Watercress Line (Hants) Walk the Line. 10 miles along the railway track from Alton to Alresford. About 450 people started from Alton and numerous others from Medstead and Four Marks and Ropley. Absolutely wonderful autumn colours, some grotty weather and some sun. It's surprising how so many walkers spread out and the countryside along the old branch line becomes very peaceful. Free tea and coffee at the two intermediate stations, yummy bacon or sausage baps at Alresford station buffet, Itchen Valley ales and a free vintage bus ride back. It doesn't really get much better! Most of my walking tends to be at weekends, but I have the opportunity to stay in a cottage in Ambleside Sunday night and with Monday booked off work I’m heading into the Langdale valley before dawn for an epic mountain day fingers crossed. Ive just returned from a very unseasonably warm Cwm Llafar Horseshoe, this afternoon. As the long term forecast for the rest of November is for some very cold weather, i thought why not take advantage of 18C and lovely sunshine. Hardly a soul out in the hills, i only saw five other walkers, and the ground was surprisingly firm, indicating that the past wet weather has yet to make an impact on the very hot summer. Only my second Cwm Llafar, and what a great walk it is. The last 2 days we took our daughter-in-law designate for a walk over Dunkery Beacon on Exmoor and a walk along the SWCP from Hartland Point before her return to New Zealand next week. A walk of mixed emotions as while we enjoyed showing her the delights of walking in this part of the world, she is off back to NZ next week and taking our son with her. Still on the positive side - it means we get a trip out for the wedding next year. I am going to take my boots - seems a shame to waste a trip. One thing I discovered - while they do have walking trails in NZ, they don't do public footpaths like we do. She was quite bemused by our little coloured arrows denoting footpaths and bridleways. In NZ it seems, private property is just that. Friends of ours, emigrated to Palmerston North, over fifty years ago, and shamefully we have not visited them. Its not that i dislike flying, but on a flight to Malta some years ago, we had some particularly savage turbulence, that even frightened some of the experienced cabin staff. Ive only flown once after the event, i prefer my feet on the ground, even though they say flying is amongst the safest modes of transport. We went to Corkscrew Swamp Sanctuary on Thursday. It was only a short walk, but felt longer due to the heat and humidity. 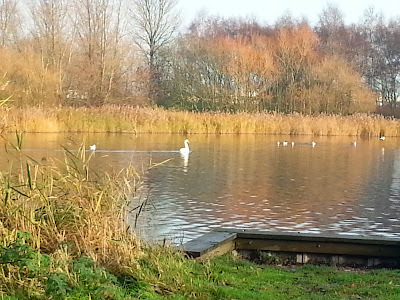 Had a lovely lunchtime walk around a work colleague's fishing lake today in lovely sunshine with a damp nip in the air.